Honoring 150 years of service with nearly 500 hand-crafted parts. True-to-scale 0.6mm stainless steel ladder. Fire Replicas uses stainless steel for its ladders, and many other components, because it allows for razor sharp precision and dimensional accuracy. We believe in true-to-scale parts instead of over-sized parts necessary to accommodate functionality. These are not toys, but rather museum grade replicas. Museum grade for the global stage. From the initial photo shoot at FDIC 2015 to the replica delivery at the same show in 2016, an intense focus was maintained on the details. Countless hours of design, proofing, and improvements make this replica museum grade. Production of #FDNY150 is limited to 600 units. Fire Replicas are designed with the elite collector in mind, and manufactured in limited quantities to enhance future value. Preserving a 150 year legacy. #FDNY150 Ferrara Rearmount Ladder measures 9"L x 2.5"W x 3"T and is securely displayed inside a custom case. The case dimensions are 12"L x 6"W x 5.25"T and the platform includes an etched stainless steel nameplate with the FDNY seal, department and truck name. Multi-materials including High-Def resin, stainless steel, wire, rubber and other composites. This Fire Department City of New York #FDNY150 Ferrara 100’ Ladder scale model is a museum grade replica. Like all Fire Replicas models, every detail is modeled to perfection and with razor sharp precision. The replica features the specific department configuration and graphics, leaving no detail overlooked. The display case is custom manufactured with high quality acrylic and resin. The stainless steel etched plate features the department seal, and the department and truck name. This replica is a treasure to be displayed and admired and is in no way a toy. In 2015, the Fire Department of New York celebrated their 150 year anniversary and to commemorate the event, ladder 24 from Midtown Manhattan, a 2011 Ferrara Ultra HD-100 Rear mount ladder was replaced at the station on the 29th October 2014 by a new unit so it could be returned to the Ferrara workshop for a very special modification. With a new paint job consisting of metallic silver cab top and red body, a wrap depicting the silhouette of the New York City skyline representing the five boroughs was added to the sides and rear. The new truck was assigned to the ceremonial unit based at Fort Totten in Queens and was used for ceremonial purposes throughout 2015 in connection with the 150 year anniversary. Fire Replicas has produced a stunning replica of the Ferrara Ultra HD-100 ladder with matching decoration which has accurately captured every aspect of the truck to perfection. Produced from high-de resin, stainless steel and other composites to achieve museum grade results, the model features a true-to-scale metal ladder with 0.6mm thick ladder sections, accurately finished with orange paint and anti-slip step coverings. The platform has raised safety grab rails with tiny chain links across the openings where steps are integrated into the rear body on the corners. The cabin interior has been finished although the decoration on the crew cab windows obscures a view of the interior. The front grill, made of photo-etch, captures the angular appearance of the truck with rectangular lights made from clear and tinted plastic framed within silver trim. Tiny handles are fitted to each of the panels and doors along the sides of the body and the upper surfaces have a fine raised texture. For the decoration, the model is first painted in a base coat of silver for the cab top and red for the body before a full body wrap is applied depicting the five city boroughs. 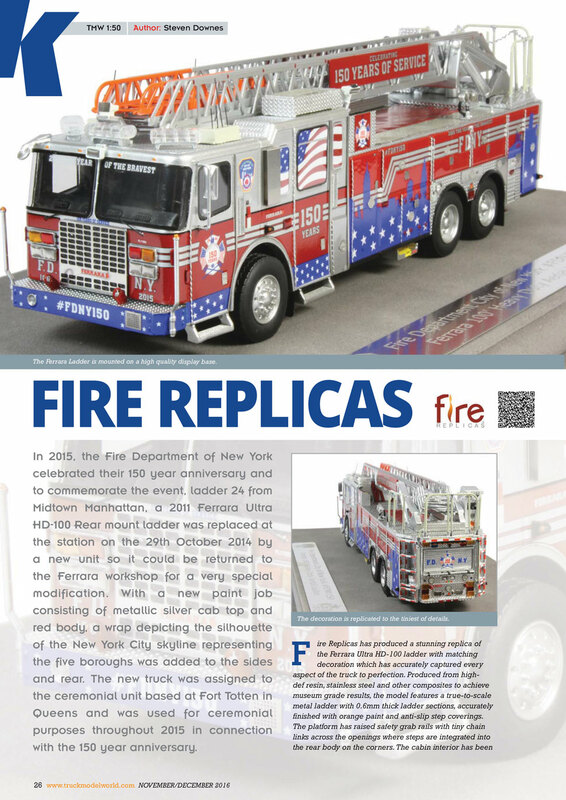 On top of this, over 100 decals are added by hand including the various slogans and FDNY markings while hand painting is used to pick out the smallest of details, something which must take a steady hand and plenty of patience, resulting in a replica which captures every single detail of the full sized truck. With each new addition to the Fire Replicas range, the bar is raised that little bit higher and for me, this is certainly one of their best releases to date. Deviating from the normal red and white cab and standard FDNY graphics, this special edition truck features a beautiful metallic silver cab top, silver leaf stripping and lettering, and a blue silhouette with white stars of the New York City skyline representing the five boroughs. Before respectfully taking the role of #FDNY150, this truck was Ladder 24. It served in Division 1 and shared its quarters with Engine 1 located at 142 West 31 ST and is near Madison Square Garden. In 3 years of service, Ladder 24 made over 9000 responses. 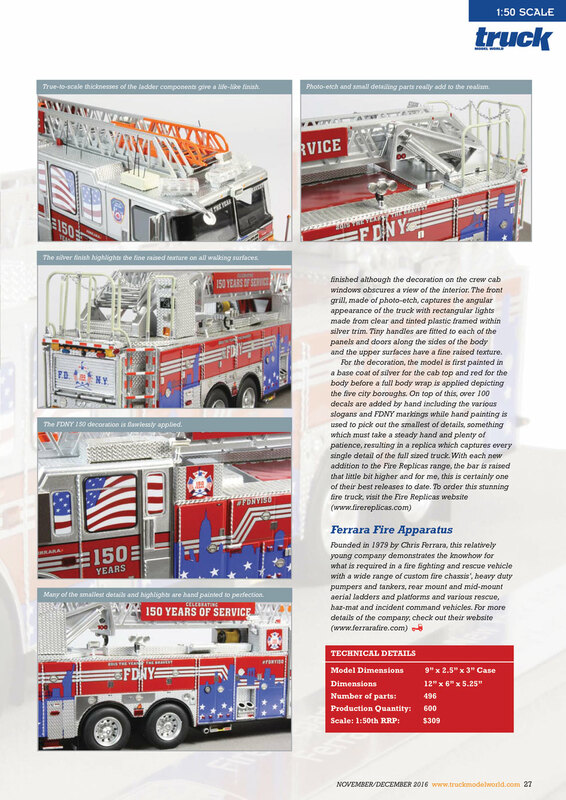 The FDNY 100’ aerial ladders are built on the Ferrara Ultra custom chassis with a 3CR12 stainless steel split cab and feature a heavy duty stainless steel body, a quick 4-section 100’ rear mount ladder, and an 8kW hydraulic generator. 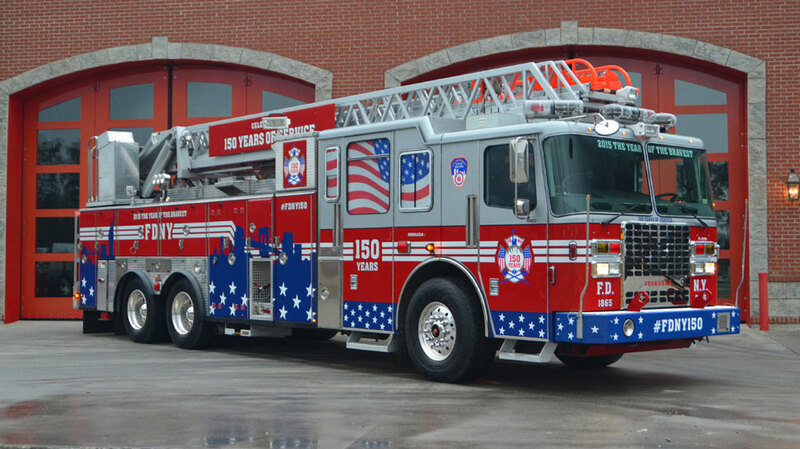 A 2011 Ferrara Ultra Model 100 foot rearmount aerial had its appearance modified with a combination of new paint and wrap and was used during 2015 for ceremonial purposes in connection with the 150th Anniversary of the paid fire service in NYC in 1865. In the future, it will be used at various parades and FDNY events. It is being kept in its special appearance and is assigned to the Ceremonial Unit, a part of the Bureau of Training and located at that Unit’s quarters at Fort Totten in Queens, which is also the home of the FDNY EMS Academy. It will be operated, when needed, by the officers and firefighters detailed to the Ceremonial Unit. The aerial, which carries registration number FL11005, is one of twenty similar Ferrara 100 foot Ultra model rearmounts delivered from late 2011 through mid 2012. Originally assigned to Ladder Company 24 in midtown Manhattan on November 8, 2011, it was replaced at that unit by a 2014 Ferrara 100 foot rearmount on October 29, 2014. Fire Replicas has out done themselves once again. The truck is a perfect replica of the actual FDNY truck. Painstakingly detailed, every little part is perfectly the same as its real life counterpart. My only downside is the truck doesn't have any moving parts, but either than that the truck is wonderful display piece for any fire apparatus collector. Fire Replicas is a worthy successor to Code 3 Collectibles. I will definitely be returning back to Fire Replicas to place my next order to keep on expanding my collection. Photos by far don't do this justice. I'm much like "James" who posted a review on 12/29/16 I too kept returning to and studying this truck countless times on the internet. I thought to myself "Stop the self-teasing and go for it". I did thinking I would get what was in the photographs, a nice looking FDNY Anniversary fire truck. When it came I was literally amazed...pictures just can't do this rig justice. I spent the immediate hours after its delivery looking at it, studying it and it was perfect in every way. I still retreat to it days later and study some more. There's so much to it and its display is like a trophy. The centerpiece of attention. My display pays tribute to these trucks, after all, they are perfect in every way and their display is tactfully done. So many people compliment and that leads to much more conversation focusing always on my collection. I'm thankful of that and pride shines through which I enjoy. Well done Fire Replicas, and thank you. This is a fantastic replica of a beautiful fire engine. Very realistic.. This is my first Fire Replicas model and I am delighted with the quality and fine detail to be found in this model. It looks superb when displayed on its base and with its clear cover to protect it. Thank you for all your help when I ordered the truck. Easiest Christmas present purchase of the year! Tim loves it! I bought the 150 Year Anniversary truck for my nephew, who is a New York City firefighter. He brought up pictures of the truck on his phone, and we both decided that Fire Replicas had simply shrunk the original. Everywhere we looked, it was perfect! This 1:50 scale model is exceptional in every aspect of the word. The truck comes in a presentation-style, outer white box which contains an insert of black foam rubber. Inside that, you'll find the model mounted on its base, with a display case top just for good measure. The model itself has a beautiful paint job, replicating the real New York skyline and a star for each of NYC's bureaus. Unlike traditional FDNY vehicles, this truck isn't your standard White over Red, with Yellow and White trade dress.The front features a beautifully replicated Ferrara grill, with towing hooks. On top, the rear-mounted ladder has diamond-plating all throughout, and there's even a safety chain at the rear of the main ladder! Overall this model exceeds every model collector's exceptions. There is no stone left un-turned in this casting. Every time you look at it hard enough, you'll notice something new. If you're a collector of museum-quality vehicles or if you collect fire fighting memorabilia, this model is a modern art masterpiece and would make the perfect gift for the adult collector. I had been looking at this New York Fire ladder 150 for months but decided against it because the advertised photograph did not really catch my attention. I knew it was a one of a kind model so every time I would check firereplicas.com, I would always take a look at 150 again, again and again. Finally with Christmas at the door steps, I decided to take a chance and order it. When it arrived and I open the box, I knew I had made the right decision to order this truck and add it to my collection. The photographs did not do this truck justice. FDNY Ladder 150 is an excellent true to life scale model. It along with the Tower Ladders will be the center piece for my New York collection of Code 3 and First Gear models. Well done Firereplicas and God Bless you. Keep them coming.